With tomorrow being Thanksgiving, I’m of a mind to list some of the things that I’m thankful for. First, my family and friends. I don’t know what I would do without either. My family (both by blood and by marriage!) are wonderful. I love the way that we always pull together whenever there is a problem or crisis. My Shoemaker family is so strong in its ties. And my friends – where to start? Many a time I’ve been down and found cheer from a friend. You are all the best. And, of course, I’m thankful for everyone who has worked so hard to make this urban arboretum go from a “Wouldn’t it be wonderful if” conversation to a “Wow! We did it” one. And I’m thankful for all of the new trees that have been planted. It does my heart good to see them as I wander the streets of Clintonville. I read in a book that trees have meanings, which led me to the all-knowing Internet. Some trees I knew about, being of Irish descent and mindful of my Celtic ancestors. The oak, my favorite, represents power, protection, strength, endurance, triumph, prosperity, success and stability. This tree was held in high esteem by both the Celts and Norse. So I think that this is a great tree for our little Arboretum, which will grow even stronger and more successful as the years go by. 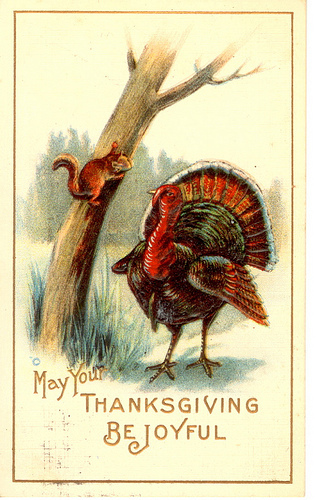 I hope that you all have a wonderful Thanksgiving.